The British record industry has experienced its biggest sales decline in decades, the BBC has learned. Figures out this week will show sales of CDs and other recorded music were down almost 4% last year, says the British Phonographic Industry (BPI). It is understood the figures will reveal the biggest downturn in a single year since the birth of the CD market in the early 1980s. The industry is blaming piracy, including illegal duplication and distribution by international criminals, for the decrease. The value of trade deliveries (albums and singles) in 2001 was just over £1.2bn - this includes LPs, cassettes and minidiscs as well as CDs. Some of the decline can be explained by price-cutting. There is fierce competition in the leisure market as rivals in the entertainment business try to woo British shoppers. But the BPI says piracy is the main factor. People are either downloading tracks from unauthorised online suppliers or buying CDs which have been illegally duplicated and are sold in street markets. "The illegal CD market is half as big as the legitimate one and is growing daily - it's a significant threat to the industry," said BPI chairman Peter Jamieson. The recording companies are not in a healthy state and have been laying off people progressively." The BPI, which works with police forces to track down the bootleg CD reproduction plants, says there is evidence of links with organised crime. Last year a total of seven million CDs were seized in raids on premises around the country, an increase of almost 50% on the previous year. Officers at the counterfeit products unit of the Police Service of Northern Ireland have told the BBC that paramilitary groups are involved. 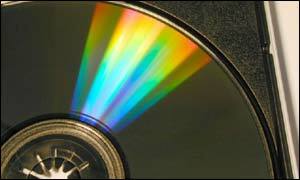 The illicit sale of CDs and other related products has become one of the main sources of income for these groups. But others, including some of the smaller record labels, say the big companies are simply not keeping up with the demands of modern music buyers. The critics argue that piracy is a convenient excuse for the record industry to hide behind. They claim that tastes are changing and people prefer a wider range of electronic formats for their entertainment. Alternatively the industry may not be offering the type of music which appeals to a younger generation of listeners. Some analysts say that the record companies must accept the reality of the internet and the desire of consumers to download music. Calum Chace, who leads the media practice at KPMG's Strategic and Commercial Intelligence Group, said: "They have to make their product available digitally and to make it more attractive for consumers to get it from them than to get it free. "They can offer subscription services where you get access to a defined catalogue for a specific time period or perhaps bundle access to concerts on a discounted basis with access to interviews." There is no doubting the fact piracy is a big problem for the music business. Industry sources acknowledge they have to adapt to the realities. But they want politicians and shoppers alike to realise that jobs and livelihoods are on the line. "The industry says it's fight against piracy will continue"